The Department of Energy and Climate Change (DECC) has produced a document detailing how the two schemes will work together. The amount of finance available through the Green Deal will depend on how much money a solar PV system will save homeowners on their electricity bills. The Green Deal loan will help to cover some of the cost of the installation. 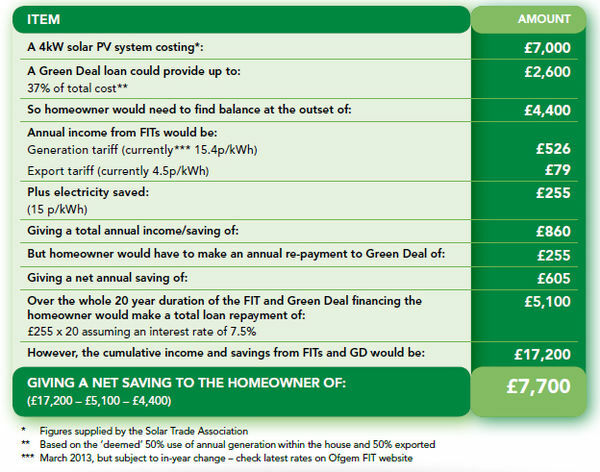 The following example shows how the Green Deal and FiTs will work. To discuss any of these incentives in more detail and to find out how you can apply them to your individual requirements please call to arrange a FREE survey or complete the form on the “Request survey” page.